• What they longest you’ve worked in one place? What’s the shortest employment you’ve ever had? • Are you reading the Bible with any regularity? Describe that experience. • Read aloud Matthew 5:31-32. What stands out to you in this passage? Why do you think Jesus is so intense about marriage commitment? Is there ever a valid reason for divorce? In the case of a divorce, why do you think a divorce certificate was important? • Remember, many of the Jewish leaders had reduced the marriage commitment so low that a man wasn’t required to have any substantial reason to leave his wife. Such a marriage dissolution was essentially referred to as an “Any Reason Divorce.” It appears that Jesus is not trying to cover every biblical justification for divorce, but that he is letting them know their low standard of marriage commitment was appalling. These unjustifiable divorces left the couple as if no divorce had ever happened, and in God’s view, the separated couple was considered still married. So, when they entered a next marriage, it was basically, the same as adultery. Jesus is trying to shock them into a new perspective; a humble, loving, and gracious understanding of the law’s intentions for radical commitment to marriage. Read Matthew 19:1-12 and discuss the reasons Jesus gives for having a dramatic commitment to marriage. 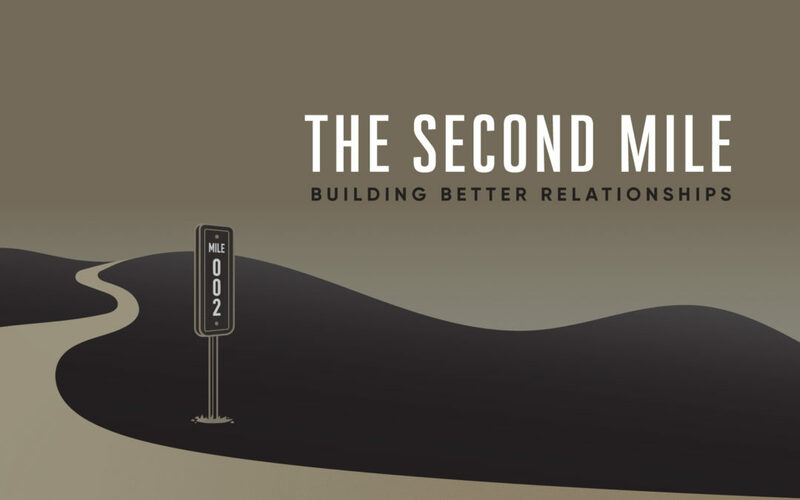 How does reflect Jesus’ Second Mile approach to relationships? • How committed are you to building vibrant, growing relationships? How many relationships in your life do you intentionally invest in? List the names of those relationships you have intentionally chosen to improve. Then list a Second Mile action you can take in each of those relationships, as an expression of your commitment to those relationships. • What is the toughest step you need to take in a close relationship right now? What would it mean to go the first mile, then the second mile? • Pray that you not only obey the Lord, but that you get to know him more, as you work hard at growing better relationships. • If you don’t currently have a reading plan, below is a weekly reading schedule for this Second Mile sermon series.